Indulge your inner-boho-hippy-self this Summer by collecting a few Californian labels at Sissy. 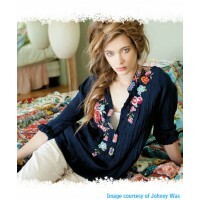 Labels include Johnny Was (Los Angeles), Biya (Los Angeles), 4 Love & Liberty (Los Angeles), Erge Designs (Santa Monica), and Daughters of the Revolution (Santa Monica). All brand new. All greatly reduced. All manufactured in California, USA. Labels are also being cleared from local Melbourne designers including HB Studio, Mist, Cake and Maud Dainty. And for those who care to tread lightly in this world: Sissy has a whole section dedicated to top quality recycled designer labels... always worth a look and always at a fraction of the original price - Who knows what bargains you may find if you look! Visit Sissy and see why their store is so popular. You are welcome to read their guestbook and leave a message for others to read.